I don't know about you guys, but when I see a truncated opening (like, no chalkboard saying or sax tune), I get a little sad. Sure, it's still nice to have a couch gag, even if it's as random as rolling up the family to be sliced like sushi... but it's not the same. I guess I tend to enjoy "fuller" openings of all television shows (which are so few and far between these days! 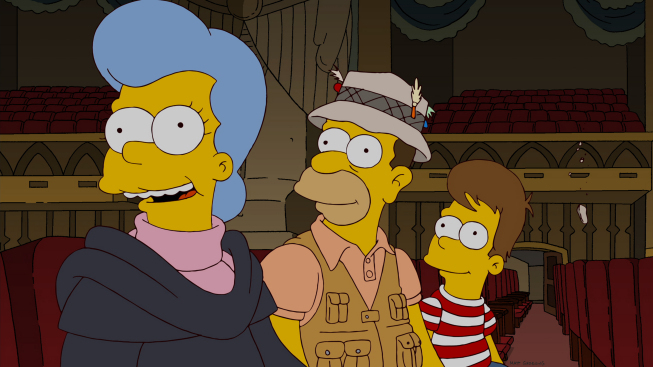 ), but the long-standing traditions inherent in The Simpsons just make the show a little better. Especially for episodes that are otherwise rather odd, like this one. We've all heard that dreams can reveal things about ourselves, but it's rare that we're able to see the actual exploration of those visions. While I would have liked to see a little more of each family member's dreams, I understand why time didn't allow that. However, I wasn't thrilled with how Homer's mother ends up being the root cause, and I certainly didn't see it coming! Thoughts?